Seitz Asks: HBO Is Forty. What Are Its Greatest Shows, Movies, and Specials? Seitz Asks: What are HBO’s greatest achievements? Seitz Answers: See list; yes, The Sopranos is on it. 10. Curb Your Enthusiasm (2000): When this sitcom debuted, a lot of people (myself included) were skeptical; it felt like a much nastier Seinfeld. But it grew more audacious and precise very quickly, and over the years it has continued to find new ways to shock and amuse us — no small achievement for a series that’s been going strong for twelve years and could conceivably hang around forever. I’m picturing David in the series finale, 90-years-old and still picking stupid fights with people, probably through an oxygen mask. 9. The Kids in the Hall (1989): This Canadian Broadcasting Corporation/HBO coproduction made cult stars of Dave Foley, Bruce McCulloch, Mark McKinney, and Scott Thompson. Hugely indebted to Monty Python’s Flying Circus, more consistently funny than Saturday Night Live in the eighties and nineties, and filled with queer characters who challenged the audience to accept their eccentricities or get lost, this was the most innovative comedy series of its decade. What, you don’t agree? I crush your head! 8. Mildred Pierce (2011): My number one scripted program of 2011, and the greatest thing HBO has ever done that wasn’t a regular series — though David Simon’s The Corner and the Mike Nichols adaptation of Tony Kushner’s Angels in America are nearly as good. 7. Mr. Show with Bob and David (1995): So consistently bizarre that I sometimes felt a bit lightheaded while watching it — though it might have just been a side effect of David Cross’ falsetto voice. 6. The Larry Sanders Show (1992): I wrote about Garry Shandling’s masterwork in a previous edition of “Seitz Asks.” The haircuts and pop culture references have aged, but the comedy and drama are as scathingly honest as ever. Every laugh-track-free modern sitcom owes it a creative debt. 5. 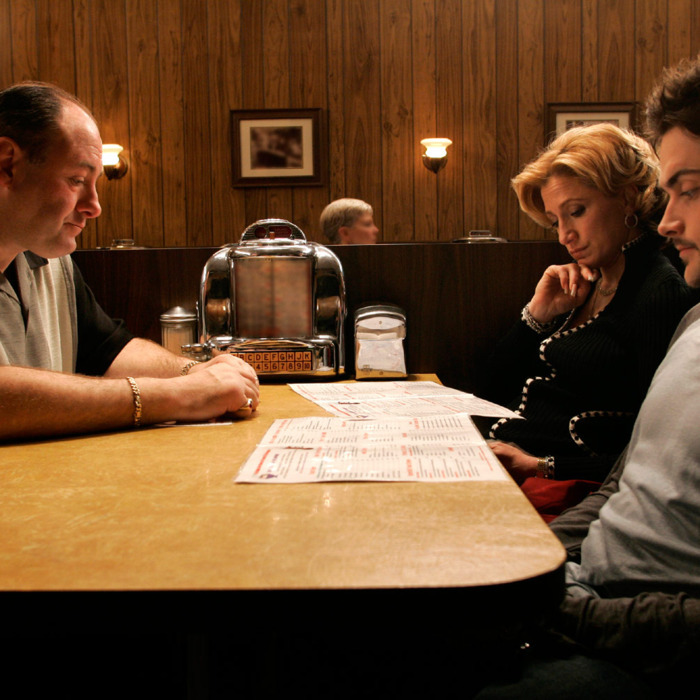 The Sopranos (1998): TV drama as you knew it? Fughedaboudit. The broadcast networks were a buncha hoo-ers. 4. Deadwood (2004): David Milch’s Western drama was the closest thing to Shakepeare that TV has ever given us. I still miss it. 3. The Wire (2003): David Simon’s Vulture Drama Derby winner, ladies and gentlemen. 2. The Paradise Lost trilogy: Joe Berlinger and Bruce Sinofsky’s Paradise Lost; Paradise Lost 2: Revelations and Paradise Lost 3: Purgatory aren’t just legally influential documentaries that sprang three speciously-prosecuted teenage murder suspects from prison. They’re magnificent examples of documentary filmmaking craft. And the way their filmmaking POV shifts over time — evolving from journalistic detachment through passionate advocacy — lends them an autobiographical dimension as well. 1. On Location: George Carlin at USC (1977): This was the inaugural special in a partnership between Carlin and HBO that spanned over 30 years. It included a climactic bit that picked apart Carlin’s most notorious routine, “Seven Words You Can Never Say on Television.” This was preceded by a printed warning: “THE FINAL SEGMENT OF MR. CARLIN’S PERFORMANCE CONTAINS ESPECIALLY CONTROVERSIAL LANGUAGE, PLEASE CONSIDER WHETHER YOU WISH TO CONTINUE VIEWING.” Because the special ran on a pay cable network, there were no “decency” issues; if you were watching it, it meant you’d paid to see it. HBO’s artistic freedom, the wellspring of its greatest achievements and excesses, really started with this special. So did the Carlin-HBO collaboration, which turned HBO into a virtual Carnegie Hall for comedians (other greats included Eddie Murphy, Ellen DeGeneres, and Chris Rock) and produced enough great moments to fill up a whole other column. Over to you, reader: What are HBO’s greatest achievements? What Are HBO’s Best Shows, Films, and Specials?